The framework of a quality bar stool is built to last, whether it is made of wood or metal. But even a quality bar stool seat may wear out, fade or tear. Rather than replacing the entire bar stool, re-cover the seat with new upholstery-grade fabric, vinyl or leather. If you have an entire set of matching stools, you may want to reupholster them all at once to keep the pieces matched. A seat may need to be taken off the stool frame before reupholstering. Flip the bar stool over or on its side to reveal the staples holding the material in place. Pry the staples out using a flat-head screwdriver or a staple remover. In some cases, you may need to remove the entire seat from the frame to access all of the staples. If so, use a Phillips screwdriver to remove screws or an adjustable wrench to remove nuts and bolts, depending on the stool's construction. Unwrap the old fabric and batting from the stool. Remove the fabric, and batting and foam, if any, keeping all materials as intact as possible to reuse them as templates for their replacements. Spread out the new fabric facedown on a clean work surface. Set the old fabric atop it and trace around it with chalk or a fabric marker. Cut out the new material along the traced lines using scissors. Smooth out the new batting atop the work surface, then set the new fabric on top of it. Trace around the fabric with a fabric marker, then cut out the batting to match the fabric. Set a new chunk of upholstery foam on the work surface. Place the old foam atop it and trace around it with a fabric marker. Set aside the old foam and cut out the new foam using a utility knife, scoring it deeper and deeper until you can cut completely through it with the knife or scissors. Stand the stool upright, or set the seat upright if you took the pieces apart. Ventilate the area. Spray adhesive on the seat area and allow it to set for a minute or two, as indicated on the adhesive can. In some cases, both the foam and seat may require the adhesive for it to stick properly. Press the foam in place and allow it to set for several hours or as recommended on the adhesive can. Smooth the new fabric out facedown a clean surface such as the floor. Smooth the batting out atop it so the edges line up. Flip over the stool and center the seat over the batting. If the seat is separate from the stool because you removed it, only use the seat portion. Press down on the bottom of the seat with a hand or your knee, then wrap the fabric and batting over the edge in one area, stapling it in place every 2 inches. Continue wrapping and stapling the materials to the bottom of the seat, pulling the material taut as you work to keep the seat smooth. In some areas, you may need to pinch, gather and fold the fabric atop itself slightly under the seat to keep it looking neat. Reattach the seat to the stool frame if you previously separated the two, using the screws or nuts and bolts taken out earlier. 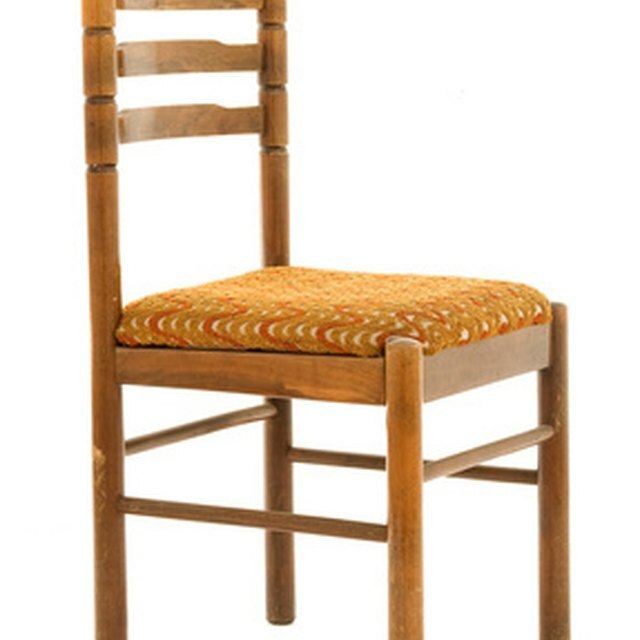 If the old bar stool fabric still is fairly clean, you may upholster over the old material, adding batting and fresh fabric directly over the old material. If the old foam is in good enough shape that is not deteriorating, you may reuse the old foam instead of replacing it. Wear eye protection when removing or adding staples to ensure eye safety.